It seems like every neighbourhood has a community centre, a supermarket, drug store, McD's, Tim's and a sushi joint. That's right, it is as common as the rest and in fact, would probably be the one constant compared to the others. That's why there are over 600 Japanese restaurants in the GVRD. 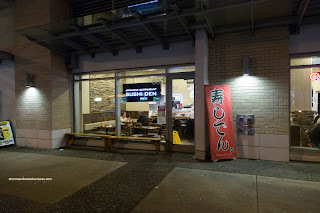 Therefore, it also means that these spots are generally not Miku-killers (if we used that as one of the gold standards), but do serve a purpose where takeout is one of their biggest money-makers. 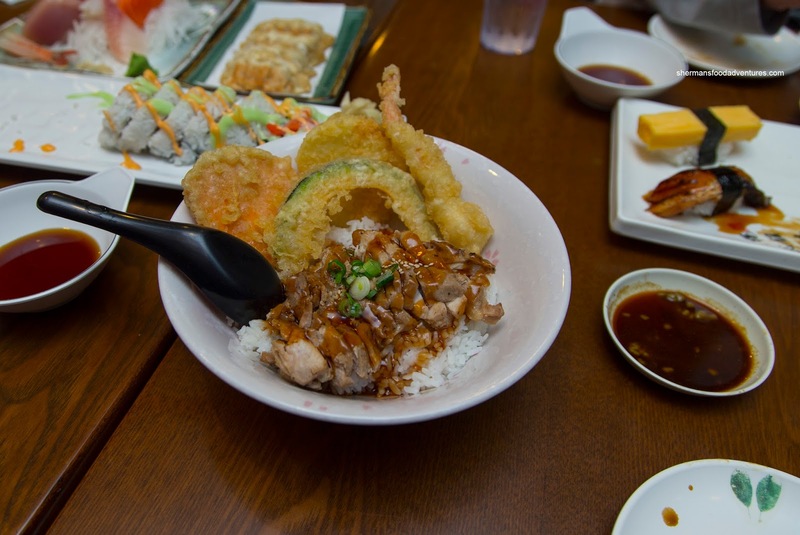 Take Sushi Den for instance. With so many high rises and Rogers Arena nearby, there is rarely a time when it isn't busy. We finally decided to check it out since we were in the area. If you ever wondered why we always seem to order Assorted Sashimi, it's not solely for Viv and myself. Rather, my daughter demands it (she will be high-maintenance in the future, I pity the boy who dates her...). 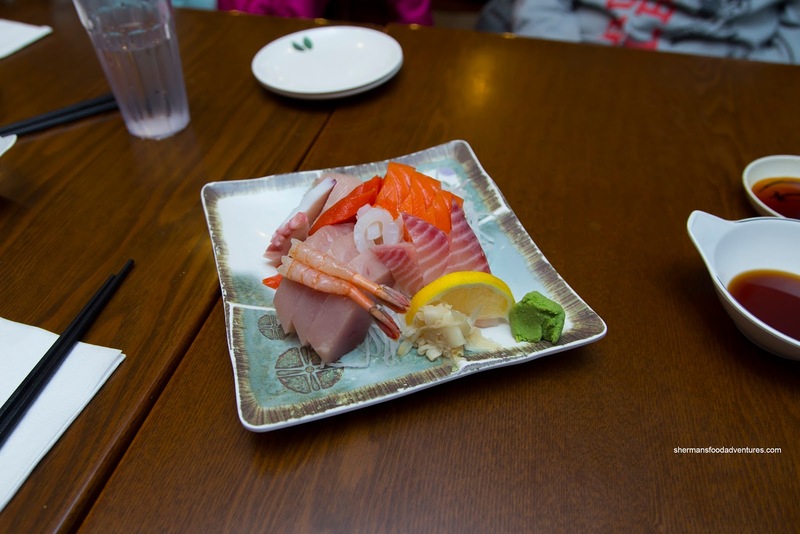 Well, this plate here consisted of Atlantic salmon, sockeye salmon, tuna, tai, toro, tako, ika and amaebi. Pretty good value for $15.00 and it was more than acceptable. Then only thing I didn't particularly care for was the toro as was strangely textured. 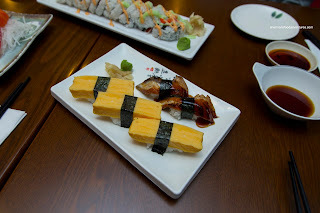 For my son, his demands was for his usual Tamago Nigiri (we added some Unagi Nigiri so there was some variety). This was rather average with inconsistently sliced egg, yet at the same time, the rice was minimal. 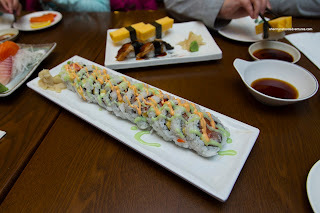 We asked for the most popular specialty roll and it happened to be the Out of Controll. Ah, so whimsically-named... This was only $10.00 and consisted of 12 large pieces. Why so cheap? Think of it as the "scraps" roll where anything goes including both types of salmon, tuna and tamago. Yes, the bits of fish in there were practically falling out, but if you aren't picky, it works. We found the rice to be a little dry, but okay. 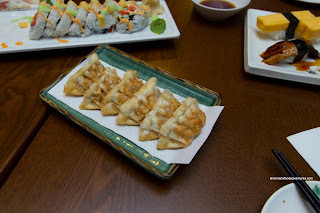 Another dish for my daughter was the Pork Gyoza, which was deep fried (not my personal preference). Despite that, it was actually not bad as the skin was only moderately thick while crispy. The best part was the tender and juicy pork filling which was a nice balance between meat and cabbage. The next 2 items were attacked by my son not only because he was hungry, but also they are his favourites. The Chicken Teri-Don was a bit heavy with the rice as there was only a modest amount of tender chicken. It could've used more sear and sauce. The rice was chewy, yet again, a bit dry (and in need of the aforementioned sauce). 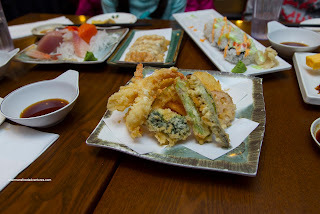 Surprisingly, it came with tempura which was doubled-up with our order of Assorted Tempura. We found the batter to be fairly thin and crispy, albeit a touch greasy. The veggies were on point including asparagus, broccoli, yam, sweet potato and lotus root. The ebi was meaty and cold-water buttery. Overall, you can probably ascertain that the food was serviceable and with reasonable prices considering its location, Sushi Den will keep the locals coming back for more.